Over the weekend, Perri and I performed a new piece at Seattle’s “Arts in Nature Festival.” As is usual in Seattle, this site-specific piece was performed in a steady rain, but fortunately for us, our venue was inside a large geodesic dome in the center of a meadow. While the rain kept the number of participants low, it did created a pleasant background noise on the vinyl surface of the dome. Because of the nature of the site, there was no power in the dome, and so rather than using our normal electronic setup, Perri and I decided to do a totally acoustic ambient piece, using passersby as our source of sound. 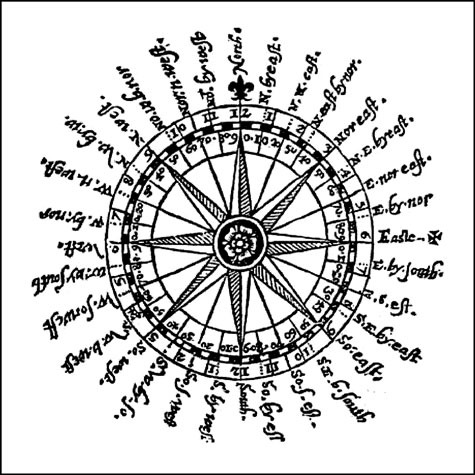 Perri has a work-in-progress that involves “boxing the compass,” or reciting the points of the compass in order. Not only is this act full of symbol and meaning, but it is also a beautiful source of sound, since there are a small number of familiar words repeated in many combinations. We decided to use this as the sonic palette. As for the structure of the piece, I have been working with simple automata to generate music for the last several years, and so we decided to use an automaton similar to a Turing machine to generate the piece’s triggers. Click on the arrow to listen to a few moments of this half-hour piece. Posted by David Stutz on Monday, August 25, 2008, at 12:17 pm with permalink. Tagged automata, automaton, boxingthecompass, mathmusic, perrilynch, radius.